FILE - photo, released by official website of the office of the Iranian Presidency, President Hassan Rouhani speaks in a cabinet meeting in Tehran, Iran. Iranian President Hassan Rouhani said Monday all officials can be criticized and that protesters in Iran are upset about more than economic issues. Rouhani also called for the lifting of bans on social media. As protests broke out nearly two weeks ago, the government instituted restrictions on messaging apps, including Instagram and Telegram. Authorities lifted the Instagram ban on Sunday, but Telegram remained blocked. Hamid Shahriari, Iran's deputy judiciary head, said Monday that all of the leading figures of "recent riots" have been arrested and will face harsh punishment. The protests are the largest anti-government demonstrations Iran has seen since 2009. Protesters complained about unemployment and rising food prices, and also called for governmental reforms. Other demonstrators rallied in support of the government. Iranian leaders have blamed foreign governments, mainly the United States and Saudi Arabia, for fueling the protests. Foreign Minister Mohammad Javad Zarif said Monday the people of Iran have the right to protest and suggested U.S. allies in the Middle East do not. He also told a security conference in Tehran that no country can create a secure environment by creating insecurity for other nations. 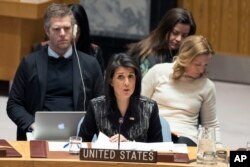 The United Nations Security Council held an emergency meeting Friday about the situation in Iran at the urging of the United States. Nikki Haley, the U.S. Ambassador to the U.N., called the protests "a powerful exhibition of brave people who have become so fed up with their oppressive government that they are willing to risk their lives in protests." She also addressed the Iranian government, saying, "The U.S. is watching what you do." In response, the Iranian ambassador, Gholamali Khoshroo, said it is a "discredit" to the Security Council to hold such a meeting on Iran in the face of the conflicts taking place in Yemen and elsewhere in the Middle East. 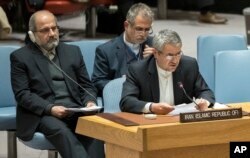 He, along with a number of Security Council members, said the United States is meddling in Iran's domestic affairs.